Congratulated by the famous pianist and conductor Daniel Barenboim, who expressed his “admiration and affection” for the conductor and the ensemble he led during the “George Enescu” Festival, awarded the Cultural Order Merit in rank of Knight (2003), conductor Iosif Ion Prunner was born in Bucharest, part of a family fond of music and with deep cultural roots. “The heritage of a family of musicians, but also that of a well-established family whose members founded churches and monasteries, one of intellectuals with fine preoccupations in philosophy, law, theater or writing: the Pîrîianu family, on my mother’s side”, said Iosif Prunner in an interview for the magazine Observator cultural. He made his debut when he was 6 years old and he played on the scene of the Romanian Athenaeum at 14. He studied at “Dinu Lipatti” Music College and at the Music University in Bucharest. He took piano and conducting classes with Zoe Popescu, Ana Pitiş, Maria Fotino, Constantin Bugeanu and Sergiu Comissiona. After graduation he became part of the orchestra at the “George Enescu” Philharmonic. In 1991 he founded the Foundation and Chamber Music Orchestra “Constantin Silvestri” and in 1996 he was the director of the eponymous International Conducting Competition. 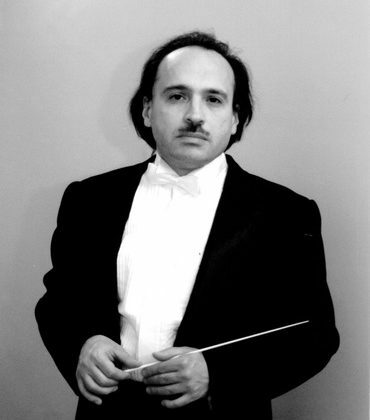 In 1997, maestro Cristian Mandeal assigned him with conducting the Philharmonic Choir, while also being asked to conduct the concerts of the Symphonic and Chamber Music Orchestra of the Philharmonic. Also, in 1997 he conducted the semi-professional doctors’ orchestra in Bucharest, following a long tradition of the “George Enescu” Philharmonic. In December 2007 he was invited, together with the Capitole Toulouse Orchestra and the Orfeu – San Sebastian Choir, to present a production of the Requiem by Verdi in San Sebastian, Toulouse and Paris – Salle Pleyel. In Romania he collaborated with the most important orchestras in the country, the National Radio Orchestra and the Chamber Radio Orchestra and he was also invited to give concerts at the National Romanian Opera. He gave concerts in important music centres in Europe and Asia (Germany, Spain, France, Italy, Japan, Russia, Greece, Hungary, Switzerland, Bulgaria, Korea etc.) and he took part in important festivals in Romania, Czechoslovakia, Italy etc. He collaborated with prestigious music personalities such as Cristian Mandeal, Sergiu Comissiona, Lawrence Craig, Valentin Gheorghiu, Ludovic Spiess, Eugenia Moldoveanu, Michel Plasson, Krzysztof Penderecki, Ion Marin, Adrian Eröd, Neil Stuart, Tatiana Serjan, Dolora Zajick, Carlo Colombara and with distinguished orchestras such as Orchestre national de France, Münchner Philharmoniker, “Arturo Toscanini” Philharmonic, the Orchestra of Warsaw’s Festival, Philharmonia Orchestra in London, Catalonia National Orchestra, Ostrava’s Janacek Philharmonic, Capitole Toulouse Orchestra.